As you can imagine, I’ve never made Pantry Pasta the same way twice because it’s really just a way of using up what I’ve got. But it always manages to be tasty and a more healthful way to eat pasta since the dish ends up being half veggies & beans and half pasta. Even better is that everyone loves it, even Mr. Picky who will just pick out any color that is out of favor at the moment. I love Pantry Pasta because I feel good that I am using my food efficiently and I can pull together an easy dinner in very little time. 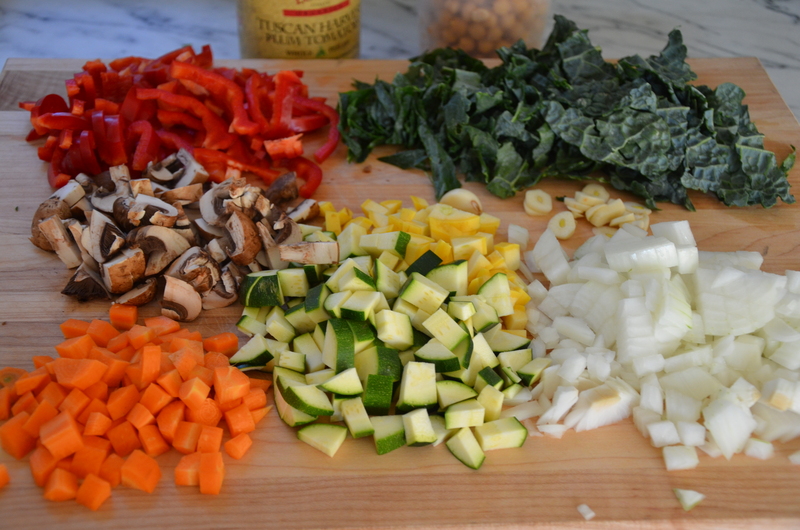 Chop your vegetables first, put the pot of water on for pasta and then start sauteing the vegetables. The key to this recipe is saving a good cup or two of the pasta cooking water just before you drain the pasta. This is a valuable ingredient in many pasta dishes since the starchy liquid can add a nice richness for the foundation of a good sauce without having to add extra oil or cream. When I had more time to exercise, I used to add a pat of butter to the pasta just before serving and before I had Mr. Picky, I would stir grated cheese into the pasta at the same time as the pasta water. He claims he doesn’t like parmesan cheese. Would it do any good if his grandfather reminded him that Mr. Picky himself is half Italian? 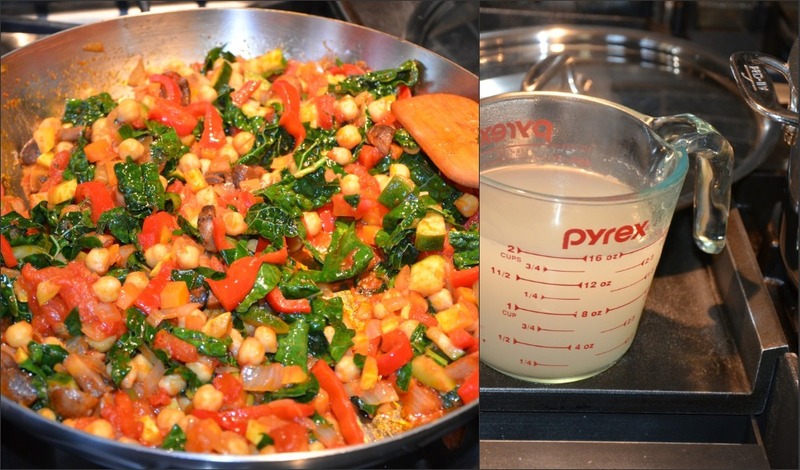 Of course, you can make these delicious vegetables and serve them atop cooked millet or quinoa instead of pasta. Just don’t tell my dad. In the meantime, heat oil in a large skillet over medium heat. Add onion and garlic and sauté until tender and translucent. Stir in remaining prepared vegetables, except the leafy greens. Season with two pinches of sea salt and a few grinds of black pepper and sauté until just tender, about 5 minutes. To the pot of boiling water, add kosher salt and pasta. Cook pasta according to package instructions. Into the skillet pour in the chopped tomatoes and beans and simmer ten minutes. Sprinkle with another pinch of sea salt. Stir in chopped greens and fresh herbs and cook until wilted. When pasta is cooked until al dente, remove two cups of pasta cooking water and reserve. 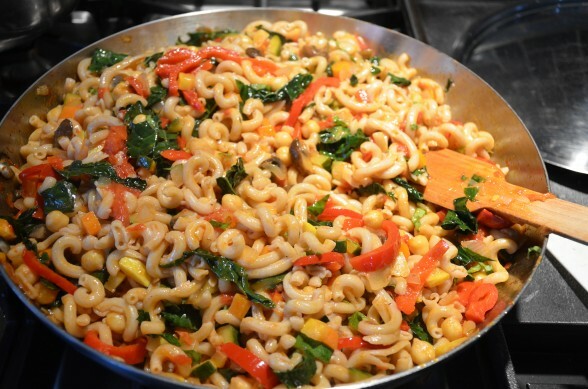 Drain the pasta and add it to the skillet with the vegetables and toss. Add enough pasta water to coat the vegetables and the pasta. Taste for seasoning and serve with grated cheese if desired. Notes: You can also add a splash of white wine to the vegetables as you are sauteing. 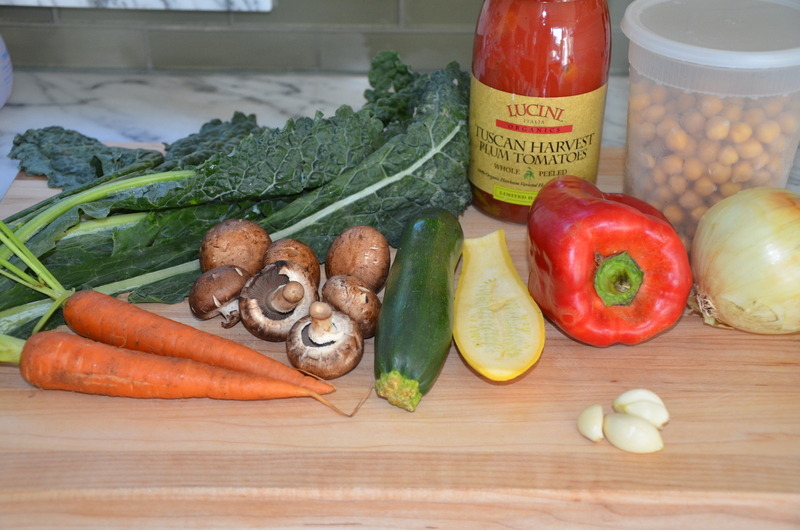 Do ahead: chop your vegetables in the morning and store in an airtight container in the refrigerator. I have made this twice as is and over loaded with roma tomatoes, oregano and basil and made it feel Italian. Toaday I cleaned out my fridge and made it Indian with cilantro and ginger and 3 bottles of Trader Joes Thai yellow curry sauce (I rinse out the last drops of each bottle for the pot with a white wine swish!) (and yes my husband has to have grilled chicken in it!) YUM! Sounds amazing! Thanks for sharing your great ideas. I am obsessed!!! Im making again tonight and adding Chicken for My Husband who clearly needs meat to feel like it’s a meal. I think this is amazing receipe. haha! at least he’s getting his vegetables. enjoy! 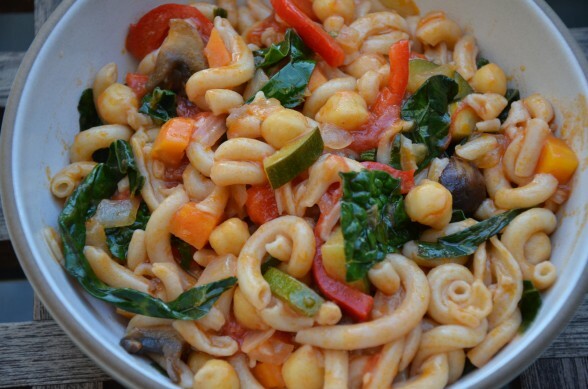 I made this tonight with Organic Farro Fusilli from GROW and everybody loved it! I also used spinach instead of kale this time. Tasty way to get lots of veggies in! Organic farro fusilli! Save me a package — I’m coming in! And to top it off, in the morning, I put it on the stovetop in a pot, heat it up and put some more fresh parmesan cheese and my kids LOVE it in their lunch! Awww, Teddi. Thanks for the great feedback! Looks delicious and easy! I will try it this week!